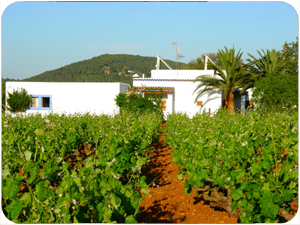 Sa Vinya den Palerm (Palerm´s vineyard) is an agricultural – cattle farm of 8 hectares placed in es Pla Roig, in Venda de Rubió, almost reaching San Miguel village. 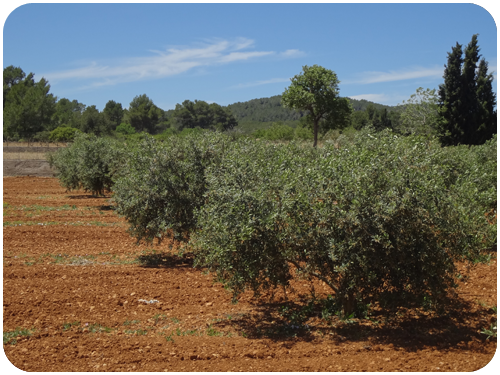 Es Pla Roig is a representative spot of Ibiza’s countryside, where the carob, almond and fig trees spread on the red land that give its name. Most of the families living in the area cultivate the land and raise animals. Walking along the surroundings will move the visitor to a world where they live differently. Plants of irrigation like tomatoes, lettuces, peppers, green beans and in summer the delicious watermelons and melons, that in Ibiza as they say have a special flavour, are cultivated in the estate. Fruit bearing trees: orange , pear, apricot, lemon, cherry, apple, etc. 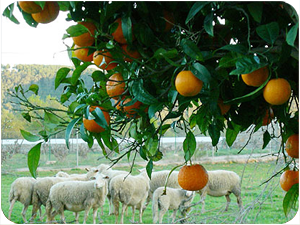 Also there are crops grown in dry land which are used to feed the farm animals: pigs, rabbits, sheep and hens. It is necessary to emphasize also the 10.000 square meters of autochthonous forest inside the estate where visitors will be able to enjoy the whole range of greens of our pines, sabine trees, rosemary, juniper, steppe and in winter they will be able to look for the Ibicencan mushrooms known as “pabrassos”. Opposite to the house, an extensive vineyard carefully tended and pampered for years, produces an excellent wine, which you should not miss.